Open Cube brings together the work of 17 artists selected from an open submission and curated by Adriano Pedrosa, a former co-curator of São Paulo Biennale. Spread across two floors with distinct themes, this could easily be two exhibitions. The ground floor of Open Cube at White Cube Mason’s Yard addresses the ideas of “inside” and “outside” the gallery space, inspired by Brian O’Doherty’s Inside the White Cube, The Ideology of the Gallery Space. Downstairs, in contrast, is a focus on more formal qualities with geometric abstraction and a recurring theme of the circular. The ground floor is dominated by Nada Prlja’s floor-to-ceiling Peace Wall. The black, chalk board-like wall is covered with messages in German, kid’s drawings, photocopies and paint. What appears to be the end point of some community project is, however, a reproduction. This wall was created after Prlja’s Peace Wall which was part of the 2012 Berlin Biennale. The project challenged the financial divide between the upper and lower city road Friedrichstrasse (a walk away from the former Berlin wall). 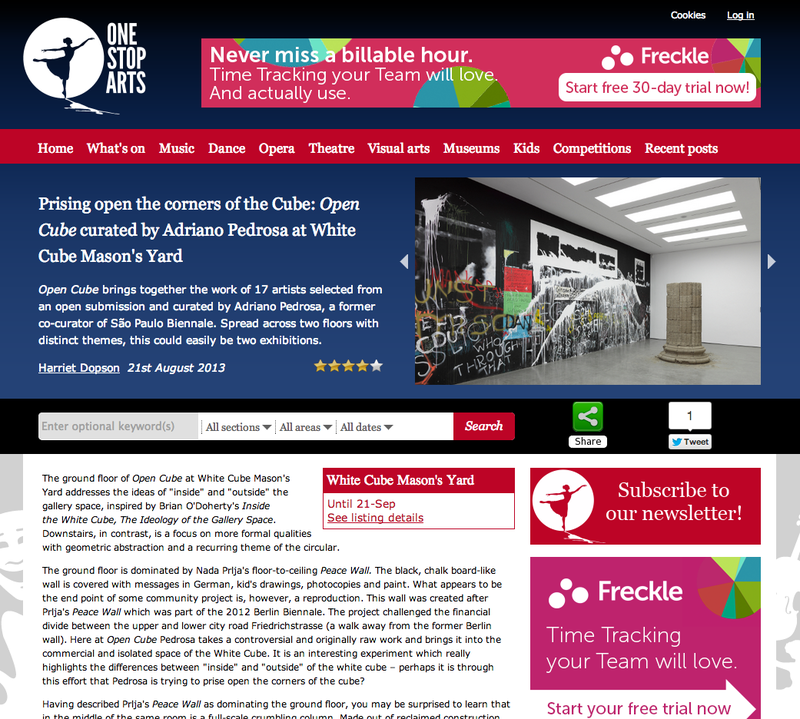 Here at Open Cube Pedrosa takes a controversial and originally raw work and brings it into the commercial and isolated space of the White Cube. It is an interesting experiment which really highlights the differences between “inside” and “outside” of the white cube – perhaps it is through this effort that Pedrosa is trying to prise open the corners of the cube? Having described Prlja’s Peace Wall as dominating the ground floor, you may be surprised to learn that in the middle of the same room is a full-scale crumbling column. Made out of reclaimed construction materials, the column still oddly seems to have some kind of precious heritage sentiment attached to it that I can’t shake, as inside the walls of the White Cube the weight and prestige of the exhibit seems to exaggerate it further – perhaps that’s the point. The ground floor also deals with another very strong political symbol: currency in Martin John Callanan’s photographic series The Fundamental Units. In contrast, Matt Ager’s delicate work Fine doesn’t quite fit in with the bold works of the of the room and his work is perhaps best appreciated above the stairway, in his work Ish, which seems to question you as you make your journey downstairs. The artists Daniel de Paula reflects Ager’s reflective mood in Toward the Great Labyrinth, a documentation of a walk which the artist took until he completed the same titled book by Hélio Oiticica. Another poetic work is Helen Barff’s display of pockets which have been separated from their cloth and filled with concrete or plaster – one of the few indexical works which feels very suited to the small room of the lower ground floor lobby. The remainder of the lower ground floor space is a harmony of shapes, material and senses. It is extraordinary to think that the exhibition was formed through open submission with no given theme when experiencing this space. Frank Ammerlaan’s huge treated corrugate-steel disk Day’s End appears to watch over the exhibition, setting the tone of the works; the tone is circular, from the circular hole in the table of Nuno Direitinho’s table in Dialogue on Tides, to the circles of Rowena Harris’s wire mobile of photocopies and the endless loop of Nicky Teegan’s sound work Prayer Battery. There is also a richness of materials such as the thick yellow of Sarah Bernhard’s work with bee pollen and the Amish quilt which is spread over a steel structure in Caitlin Yardley’s Black Refract. The works in this room really bounce off each other and it is impossible to account for them all here. It is really is enjoyable to discover these new works, especially as this platform, White Cube gallery is usually for a select few. It is perhaps here that I should pause on Pedrosa’s concept of an open and transparent cube, which was the purpose of the open submission. It undoubtedly is a triumph to see so many artists have the chance to exhibit together, although I do question how far the boundaries are really being pushed as out of the 2,900 applicants (the only requirement was to be available for an interview in March) over half of the artists who exhibited have studied or are currently studying at RCA or a UAL college. This does feel disappointing if Adriano Pedrosa really was aiming to challenge the “inside” and “outside” of the gallery world. Regardless, the exhibition is an ambitious summer show which really is worth seeing for the strength of both themes and the thoughtful curation of each room – especially in the lower ground floor gallery.